It's been a while since I reviewed a memoir. There was a time when I was really into this genre and read all the memoirs I could get my hands on. I even wanted to write a memoir myself, but had to put that project on hold because--I don't know if you know this--memoirs are really, really hard! You'd think at first glance that they would be easier to write than fiction because you're drawing from real life events, and the writers who do it well make it look effortless. However, a memoir has a very difficult task to accomplish: take something that is, by definition, complicated and without end (LIFE) (let's pop some bold and underline on that actually) (LIFE) and transform it into a neat, linear story with a beginning, middle and end. Life is very unsuited to literature. It defies the standard three-act structure, never supplies the satisfying story and character arcs that make for compelling fiction, and has this nasty way of just petering out into the next series of events without giving you any satisfying conclusion. There are no bangs at the end so you know when to clap. Maybe if they'd shot him out of a cannon at the end? 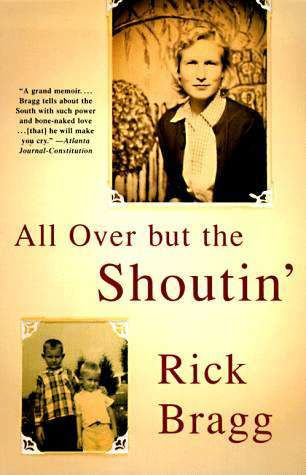 As proof of my theory, today's author, Rick Bragg, had to win a Pulitzer in journalism before he wrote his memoir, "All Over But the Shoutin." Or maybe that's just a coincidence. Either way, it's quite a good memoir about growing up poor in the rural South. This describes a lot of offerings in the memoir genre, I know, and Bragg admits at the beginning of his book that his is a very typical story and perhaps of no interest to anyone. He didn't write his memoir to break new ground, but rather because his beloved grandmother died and made him aware of how little time certain members of his family may have left on the earth. He wanted to capture their stories and life experiences before they died, because they'd always been dismissed as unimportant in the eyes of society, but were important to him personally and therefore worthy of memorializing. I don't think this is best memoir I've ever read, but I found it noteworthy because of how self-effacing Bragg is in describing his life. Memoir writing is inherently a narcissistic endeavor, in that the author assumes that whatever happened in her life is so fascinating that the rest of the world needs to know about it. Frequently the author is correct in that assumption, otherwise why would we read memoirs? But Bragg's memoir is significant because he focuses less on what makes him and his family unique, and more on what makes them the same as all the other people he meets later in life as a journalist, even if those other people are freedom fighters in Haiti or bodega owners in the Bronx. There's a wonderful universality about Bragg's writing that you don't often encounter in the memoir genre. The book does suffer in a few places from having a too much emotional distance from its main subject--Rick Bragg--but makes up for it by imbuing even passing characters with liveliness and humanity. Final Grade: B. Recommended for fans of memoirs, stories about the South, and those interested in journalism.